As a general rule, I dislike the “newborn phase”. Newborns are challenging! I know some love the newborn phase. The newness of life, the newborn noises and smells. I enjoy those aspects of course, but the sleepless nights and frequent feedings are very tiring, especially when you have older children that are up and ready to start their day even though you were up with the newborn half the night. My youngest is just four months old and we are just now coming out of the difficult “newborn phase” with him. All of my children are adopted and all three of them had to go through Neonatal Abstinence Syndrome (NAS) upon birth due to drug exposure in the womb. This is the main reason I dislike the “newborn phase”. There is nothing fun or pleasant about watching your baby go through something like that. My son spent the first four weeks of his life in the NICU. When we brought him home he required constant 24/7 care. Because of severe stomach pain associated with eating and digesting food, it took him over one hour to eat. After he ate, he would be in extreme pain that often times would last until it was just about time to start the cycle over again with his next feeding. Even if there was no drug exposure in the womb, the first 3-4 months of a baby’s life can be extremely challenging, especially to a new parent. You might be thinking that your life is over and you will never feel normal again! You might be wondering if you will ever sleep again for more than 1-3 hour increments. You might be wondering if your baby is going to forever be fussy during the hours of 7-10pm. You are also probably wondering if anything you are doing with Babywise is going to make a difference! This was my 3rd baby but the one most affected by the NAS. I held him more than I didn’t during his first month or two of life. I thought for sure I was going to have a baby that didn’t know how to sleep in the crib. But you know what I learned? If there is a genuine issue going on with your baby (NAS, colic, witching hour, etc.) holding baby to sleep is NOT going to “spoil” them. My son needed me to hold him as much as I did. When I could, I would lay him down to sleep in his Rock N Play. I always encouraged sleep in there because I knew my ultimate goal was not to co-sleep but to have him sleeping in his own bed. As time passed and his pain decreased more and more, do you know where my son wanted to sleep? His Rock N Play! There was seriously a day when I was trying to get him to sleep in my arms and I realized he wanted me to put him down in his bed! From then on, he has slept in his bed for the majority of his sleeps. This too shall pass. And in the meantime work towards your Babywise goals when you can. With babies, they are constantly growing and developing. Focus on full feeds, eat-play-sleep cycles, appropriate wake times and, for newborns, Valerie’s Sleep Hierarchy and, with the passing of time, you will notice improvements. At 4.5 months old, my baby’s eating and sleeping patterns are well established and he is most definitely a Babywise Baby. 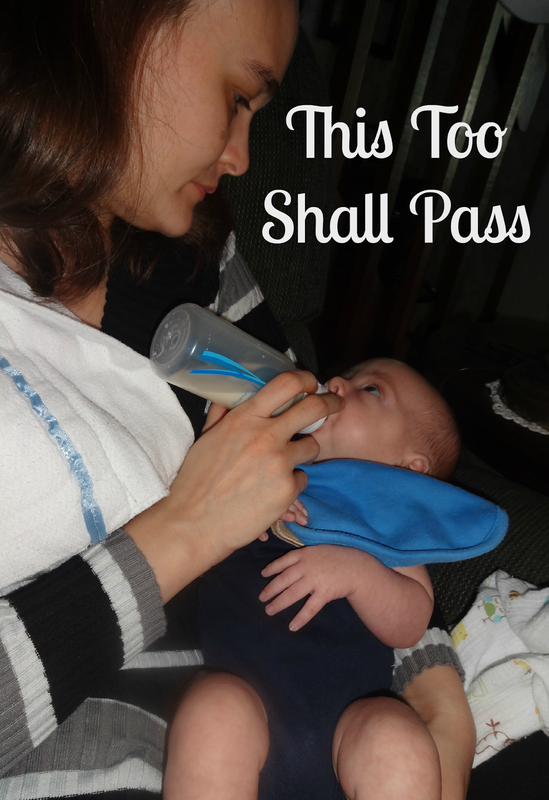 I know difficult phases will arise again, but I also know….this too shall pass! !